Flowing green pastures, dramatic lava fields, spectacular structures, snow-capped mountains, glaciers, fjords, incredible history, and yes, magic. These things all combine to make what could be an unforgettable adventure if you are willing to throw caution to the wind and hit the road. The people of Iceland are kind-hearted, helpful and generous. It makes traveling through this northern European nation effortless, as long as you are prepared for the journey. 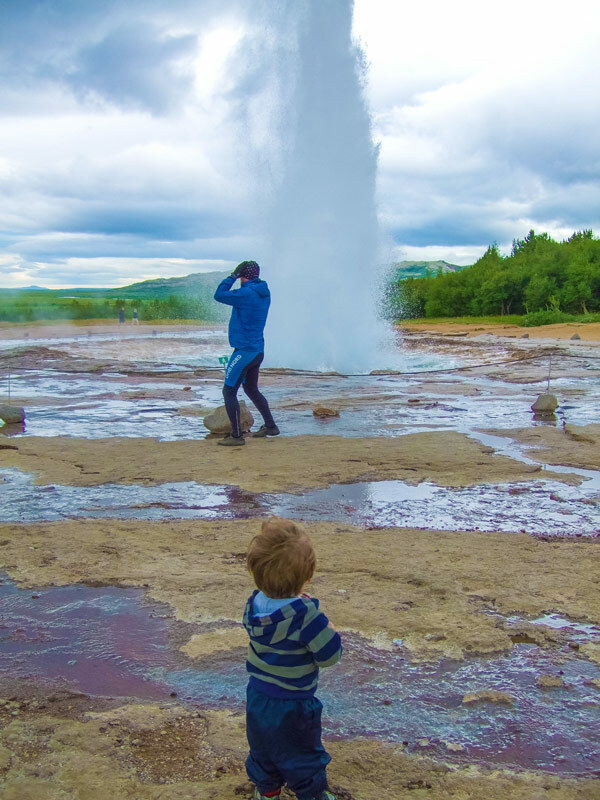 While searching for what to do near Reykjavik, we found lots of options, but the perfect place to start a trip is Iceland’s Golden Circle tour with kids! Christina and I packed our one and half-year-old son C into the car. We made our way to the airport for a quick 5-hour red-eye flight from Toronto to Keflavik, Iceland aboard Icelandair. After getting C settled down on the plane, we dozed off for a quick nap before waking up on the ground. Clearing Icelandic customs was a breeze and we hailed a taxi directly from the airport for a short cab ride to our Reykjavik hotel for a snooze before hitting the town to find the best things to do in Reykjavik. Pro-Tip: Iceland is one of the safest countries in the world. Their taxi system is trustworthy and organized. You can feel confident hailing taxis directly from the airport without being scammed. Reykjavik is very much a modern European city, full of excellent cafes, small shops, and high-end clothing stores. And like many nations with a rich history, its Viking heritage is never far from sight. As we searched for the best attractions in Reykjavik, we discovered The buildings in the city maintain the Nordic angles and chalet-style feel while integrating modern, convenient amenities. We wandered through the capital of Iceland for the afternoon, checking out the beautiful downtown and tasting the local cuisine. Luckily, there are many things to do in Reykjavik on a budget. For those looking for things to do in Reykjavik at night, The city has a very popular club scene. The bars and clubs are often open through the night and into the early morning and are especially lively during the bright nights of summer. 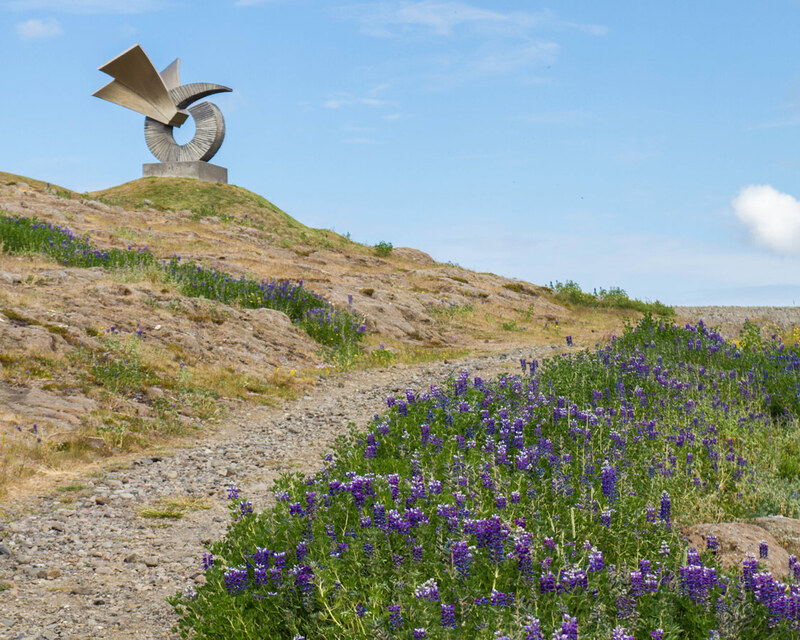 For those looking to explore even deeper, some fun things to do in Reykjavik include visiting the Cathedral in the city center or exploring the harbor with its famous Viking boat statue. We also loved exploring the markets and shops of the town. Although Reykjavik is a metropolitan center, it’s small size makes it very easy to explore. Reykjavik is the center of the action in Iceland. Whether you are setting out for a tour of the Ring Road, or just the nearby attractions, visitors almost always start here. 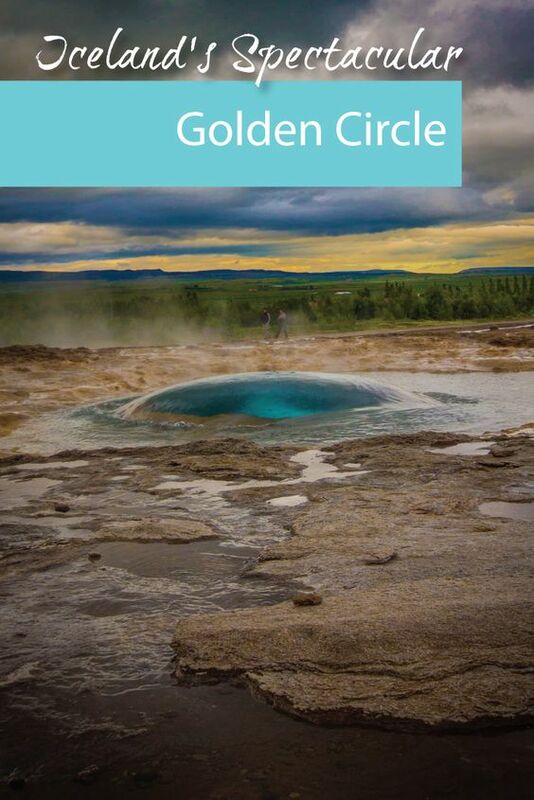 When you’re looking for what to do in Iceland, the main attraction is always the Golden Circle tour. We figured with our jet-lag, a Golden Circle bus tour would be a good introduction to Iceland before picking up our rental and exploring Iceland on an epic 14-day road trip. In fact, after completing our fourteen-day tour of the country, we decided it was worth it to go back and experience a Golden Circle self-drive for ourselves. The trip, with stops, will take you around 6-8 hours. 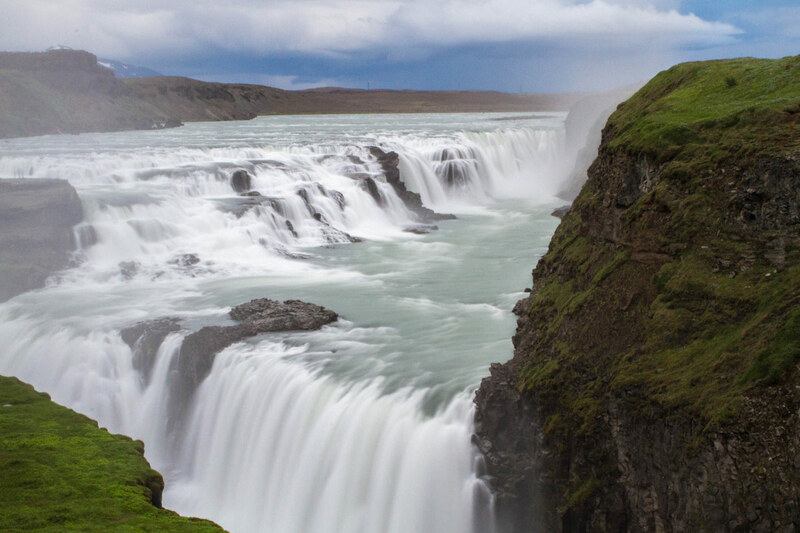 Even if you don’t have a lot of time to spend in the country, or are experiencing Iceland as a stop-over on your way to the rest of Europe, a tour of the Golden Circle in Iceland is definitely worth your time. There are a number of companies that offer tours of the Golden Circle, and it’s difficult to pick the best golden circle tour Iceland as most of the companies excellent, well-managed and organized. The first major stop within the Iceland Golden Circle in Thingvellir National Park. From 930-1780 AD, this was the heart of Icelandic politics. The capital then moved to Reykjavik. Icelandic people from all over would flock to this breathtaking location for speeches, lawmaking, and celebrations. The Golden Circle Iceland marks where the North American and Eurasian tectonic plates are slowly tearing the country apart a few centimeters each year. This tectonic activity creates deep fissures in the landscape, many of which fill with ice-cold glacier water. 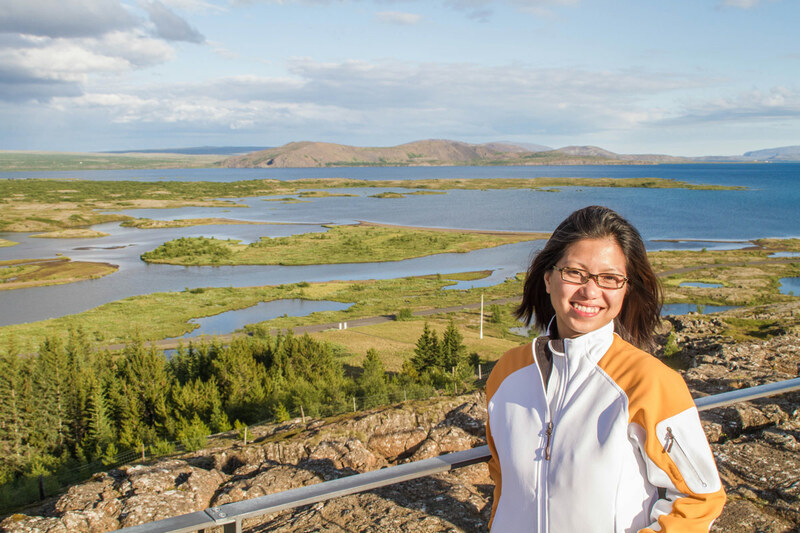 A Thingvellir National Park Tour is a highlight of many of those who travel to Iceland and can be done separately, or as part of a Golden Circle Tour. The Silfra Crack, one of these features makes for a popular and unique snorkeling and diving day trip from Reykjavik. 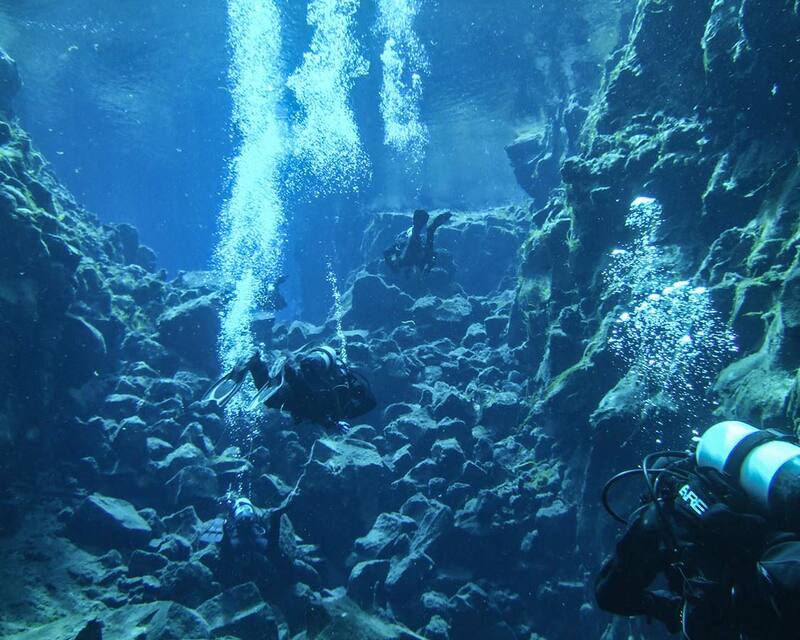 You can read all about our Silfra Diving experience here. Pro-Tip: Before driving the Iceland Golden Circle, make sure you get a roadmap of Iceland. It can be useful to have even if you have a GPS. The next big stop on the Iceland Circle Tour was Haukadalur Iceland. Haukdalur is a hotbed of geothermal activity approximately 60 km north of Thingvellir National Park. Haukadalur is home to two famous geysers: Geysir and Strokkur. The term Geyser comes from this famous ancient feature. It no longer erupts due to an earthquake a number of years back. The paths here, and in most of Iceland are not stroller friendly. So if you are visiting with young children, I recommend using a kid-carrier to get around. You can read about our favorite kid carrier here. The Strokkur Geysir in Haukadalur erupts nearly every 10 minutes, exploding with searing hot water that launches nearly 100 feet into the air. Many people take the time to watch the activity, and some are lucky enough to catch a shot of the brilliant blue bubble that forms for a brief second prior to the geyser shooting skyward. The geysers are located along a short walking path, just outside of Haukadalur’s restaurant and gift shop. This location gives you access to nice clean bathrooms for a civilized break as you wander the Icelandic interior. I highly recommend their delicious pies! Off the main road on the Golden Circle Iceland, you can access Gulfoss. Gulfoss waterfall is probably the most famous Icelandic waterfall. The fast-moving Hvítá river rounds a corner and drops 100 feet into a deep, narrow crevasse. It is not rare to be treated to thick mists and rainbows filling the sky amidst the dramatic landscape. To access the epic view of Iceland’s most famous waterfall we parked and then descended a long staircase to a concrete walkway that allowed us to walk along the cliff edge over the river. Be careful here, due to the mist, the walkway can be slippery. Also, you can get very wet close to the mouth of Gullfoss. So, bring a rain jacket and cover your camera equipment. I recommend picking a camera rain cover like this if you don’t have a waterproof camera like the Olympus Tough series. 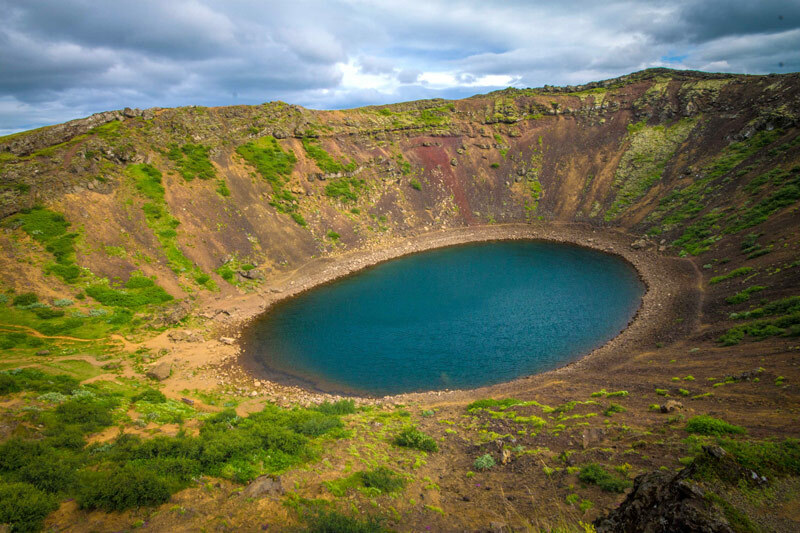 The final stop in the Golden Circle tour is Kerid Crater Lake, a brilliant blue crater lake contrasting harshly with the red walls of the extinct Kerid volcano. The hike to the bottom of the crater takes about five minutes, and it’s not rare to see locals fishing for fun or for their dinner within the well-stocked lake. Another famous part of Thingvellir National Park is the Silfra Fissure. This crack through the middle of the country is where the North American and European continents are slowly tearing apart at a rate of a few inches per year. The glacier-fed stream that fills the continental divide has become one of the worlds most famous SCUBA diving spots. The waters of the Silfra Fissure are crystal clear and so clean that you can sip the water directly from the stream. And trust me, it’s delicious! You can read all about our adventure diving the Silfra Fissure in Iceland here. Located about an hour north of Reykjavik, along the Ring Road is the Icelandic Settlement Center. The Settlement Center was a highlight of our visit to Iceland with kids. It gave us the chance to temper our Iceland adventures with some of the countries rich history. Acting as a sort of Viking Museum, the Settlement Center in Iceland introduces visitors to Egill Skallagrimsson, Iceland’s most famous poet, and author of many of the Icelandic Sagas. The tours are offered through an audio tour in many languages. 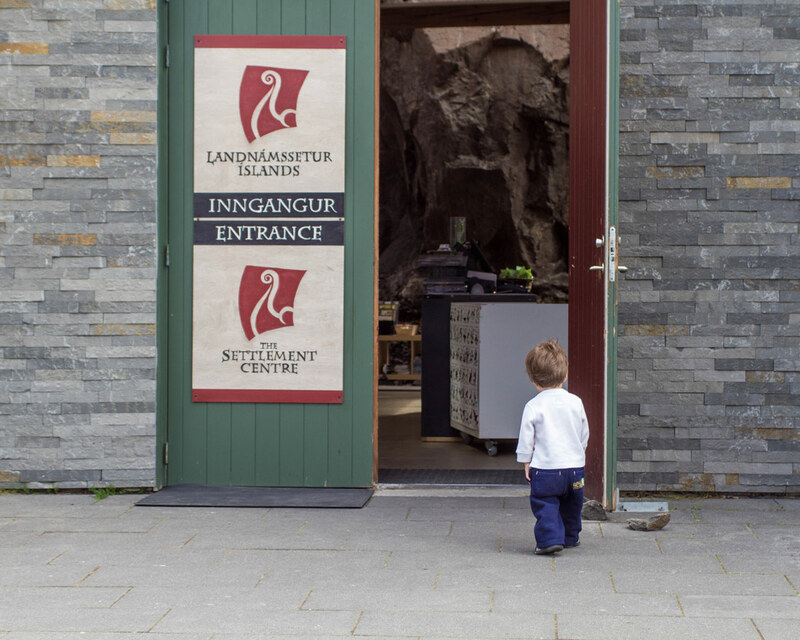 The Settlement Center is one of the best things to do in Iceland for those looking to know more about Viking and Icelandic history. On our last day in Iceland, we found ourselves with some time on our hands before our early afternoon flight. We figured that leaving Iceland without visiting the famous Blue Lagoon would be a big mistake. 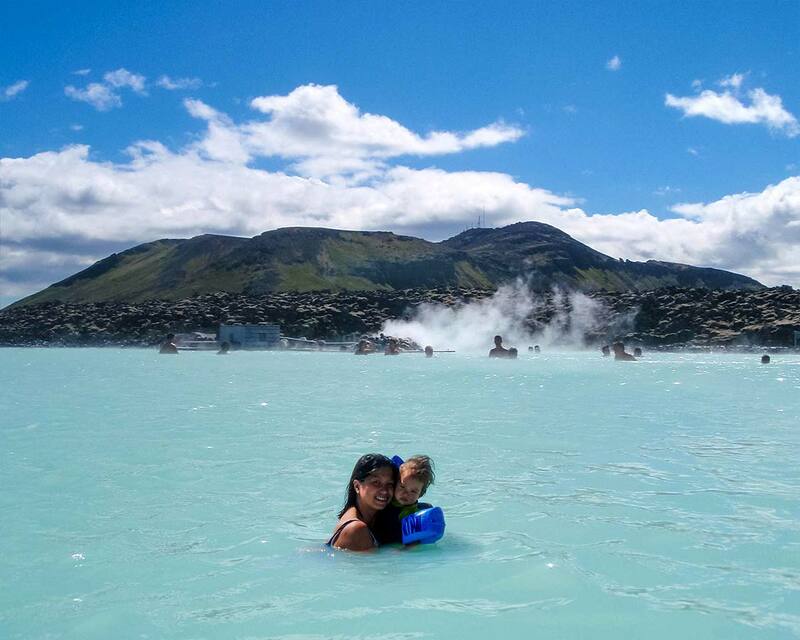 Located just minutes from the Keflavik International Airport, the Blue Lagoon makes for an easy addition to a trip to Reykjavik, and for us, it made for a relaxing end to an amazing adventure. While the Blue Lagoon, like most of Iceland, is a must-see experience, my personal opinion is that it offers a corporate environment and lacks the intimate, natural touch of the local Icelandic baths and smaller hot springs, such as the Lake Myvatn Nature Baths. Nevertheless, we bathed in the beautiful blue waters and treated ourselves to a facial scrub. We got some much-needed relaxation before we left for the airport for our flight back to Toronto. Iceland doesn’t have to be a long-term trip either. To see how Reykjavik can be done as a stopover, check out this post from Anna Everywhere. The Guesthouse Aurora is a quiet, neighborhood guesthouse located not far from the Hallgrimskirkja church. The rooms are simple and comfortable. And DARK, which was important for our first stop after a red-eye flight with a 1-year-old. The Guesthouse Aurora was clean and comfortable. Not luxurious, but efficient and relatively inexpensive. You can check out prices and availability here. Our final two nights in Iceland had us upping the luxury travel aspect of our trip. After 14 days of touring through the Icelandic countryside, we were due for the “vacation” portion of our visit to Iceland. The Hilton Reykjavik Nordica certainly lived up to its reputation. In fact, we learned that Tom Cruise was staying there at the same time as us while filming for his upcoming movie. It turns out he was even SCUBA diving in Silfra the day before we joined that tour. You can check out the prices and availability here. If you are looking for more options, you can use this tool to check out the prices and availability of other hotels in and around Reykjavik, Iceland. Do you have a favorite experience in Reykjavik or around the Golden Circle? Let us know in the comments, or feel free to contact us with your suggestions. We were there in the winter. Near the Geysers it was a sheet of ice. It would freeze solid overnight and then not daylight long enough to melt it during the day. So the geysers looked like the were erupting from an ice skating rink. Down by the blue lagoon, the ground was warm enogh from the geothermal activity there was no snow and it was even a bit green! That must have been so cool! I’d love to return in the winter! hello ? 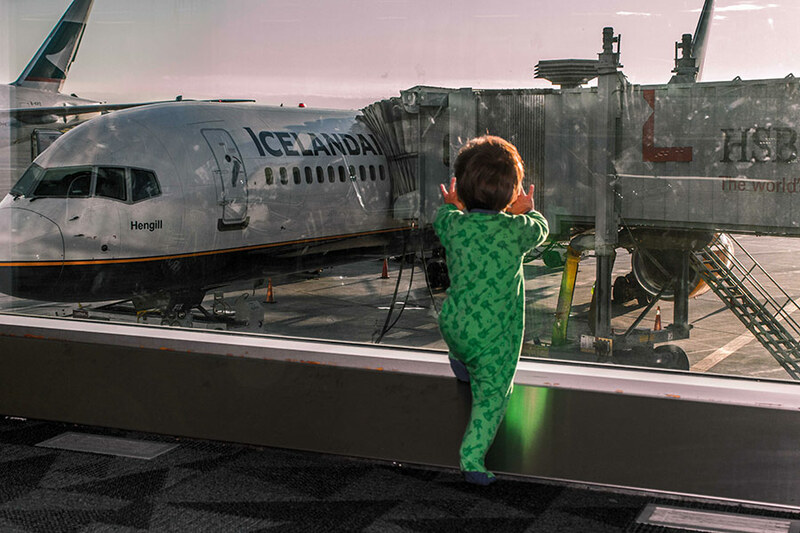 we are traveling on may with our 22 mos baby on iceland, this is realy helpfull? -ijust want to ask i emailed the blue lagoon if our son can go with us on the pool , they said no , bcoz its strictly of 2 year old ? 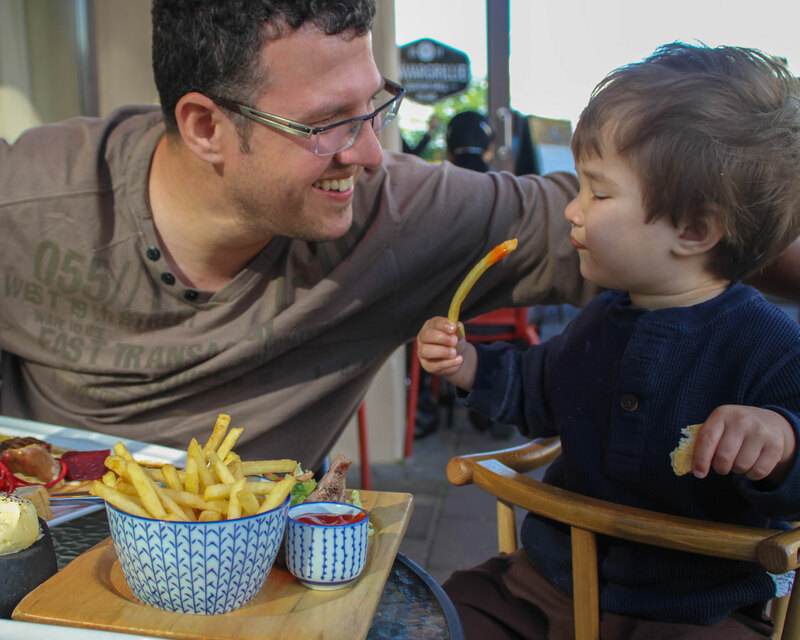 Our son was 18 months when we went and we didn’t ask if he was allowed to enter and they didn’t say that we weren’t, so it could have been a don’t ask, don’t tell scenario or they may have since changed their policy. What’s the best time to visit Iceland you reckon? I reallllyyyy want to go there next year and need to start planning now. Do you also recommend skipping the blue lagoon for a better place like the one you mentioned? 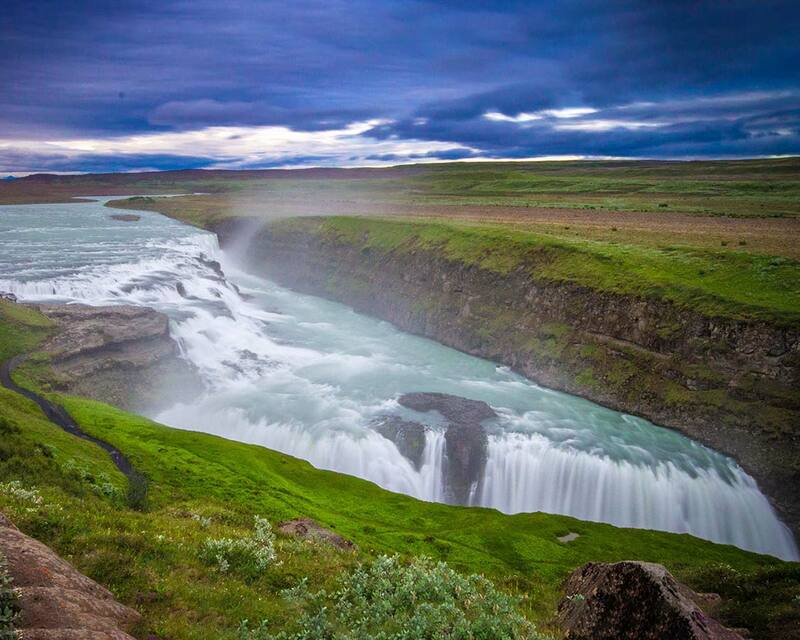 Stunning photos and i love the Gulfoss. Iceland is a dream destination for me. I hope we can make it there before it is too late. This country has so much to offer and may of those are surreal beauties.